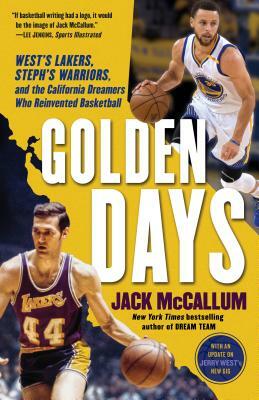 In Golden Days, acclaimed sports journalist Jack McCallum uses two teams—today’s Golden State Warriors and the L.A. Lakers of the early 1970s—to trace the dynamic history of the National Basketball Association, which for much of the last half-century has marched memorably through the state of California. Tying together the two strands of McCallum’s story is Hall of Famer Jerry West, the ferociously competitive Laker guard who later became one of the key architects of the Warriors. With “the Logo” as his guide, McCallum takes us deep into the locker rooms and front offices of these two era-defining teams, leveraging the access and authority he has amassed over his forty-year career to create a picture of the cultural juggernaut that the NBA has become. Featuring up-close-and-personal portraits of some of the biggest names in basketball history, from Wilt Chamberlain to Steve Kerr to the transcendent duo of Stephen Curry and Kevin Durant, as well as an update on the Warriors’ continuing run of dominance and West’s first season with the L.A. Clippers, Golden Days is a history, not just of a changing sport, but a changing America. Featuring vintage photos and contemporary shots of NBA greats including Stephen Curry, Kevin Durant, Wilt Chamberlain, Jerry West, Elgin Baylor, Pat Riley, and more. Jack McCallum is the New York Times bestselling author of Dream Team and Seven Seconds or Less and a longtime member of the staff of Sports Illustrated. While concentrating mostly on basketball—in 2005 he won the Curt Gowdy Media Award from the Naismith Memorial Basketball Hall of Fame—he has also edited the weekly Scorecard section of the magazine, covered five Olympic games, and written about virtually every sport, including bowling, bicycle racing, squash, and wrestling. McCallum teaches journalism at Muhlenberg College and lives with his wife in Bethlehem, Pennsylvania.